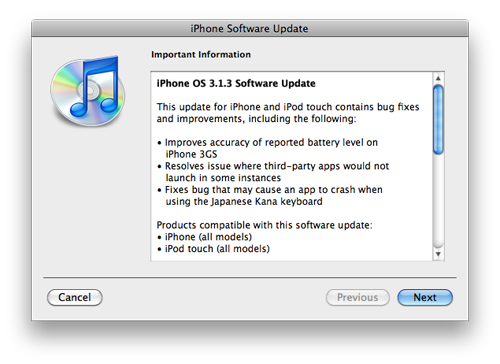 Apple released 3.1.3 firmware today that addresses a few minor bugs but doesn't appear to offer much, if any new features. As always, do NOT upgrade if you rely on a jailbreak or unlock. Some have reported the old bait and switch trick works with Redsn0w (point it to 3.1.2 when it asks for the firmware) although I wouldn't recommend it. The best thing to do is make sure Cydia has your SHSH files stored for previous firmware versions and WAIT for the Dev team or Geohot to come up with something. This DOES update the baseband on the 3g and 3gs, so if you accidently upgrade and manage to downgrade with your stored SHSH's you will still have the new baseband and will lose the ability to unlock!